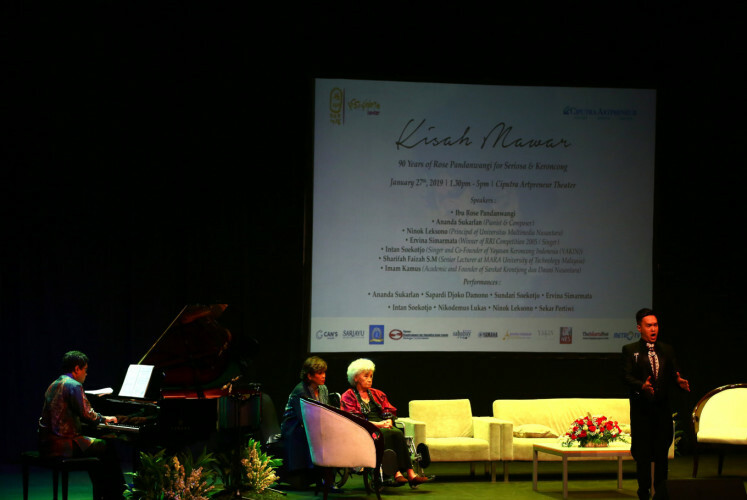 A tribute to the seriosa and keroncong musical genres in Indonesia entitled Kisah Mawar: 90 Tahun Rose Pandanwangi untuk Seriosa dan Keroncong (The Story of Mawar: Rose Pandanwangi’s 90 years of Seriosa and Keroncong) was held at Ciputra Artpreneur in South Jakarta on Sunday in the form of discussions and performances. 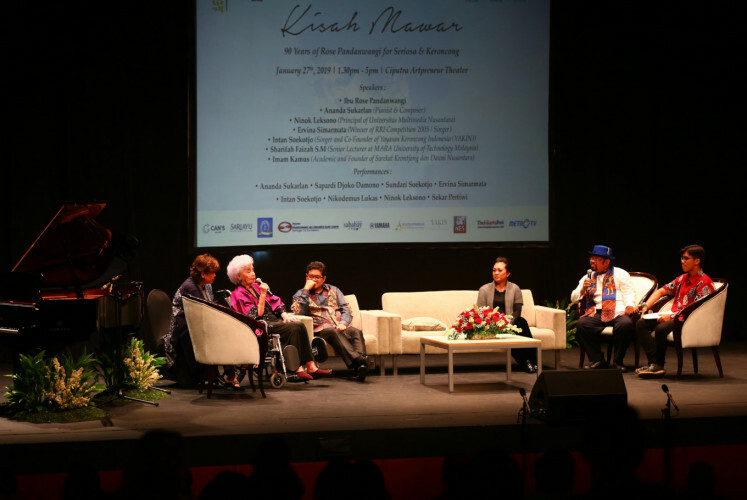 The event was initiated by Rose Pandanwangi, 90, a legendary Indonesian seriosa and wife of maestro S. Sudjojono, who felt concerned for the continuation of both genres, especially among the younger generations. In the first discussion, one of the speakers, Imam D. Kamus, founder of the Sarekat Krontjong organization and the Dawai Nusantara festival, said that what makes keroncong unique was the use cak and cuk ukuleles at its core. In the second round of discussion, which highlighted the origins of seriosa and Rose Pandanwangi’s story, a senior lecturer at Malaysia’s MARA University of Technology, Sharifah Faizah S.M., said that although the term seriosa was popularized by state-run Radio Republic Indonesia (RRI) to label a new category for their Bintang Radio (Radio Star) competition, the genre had actually existed in the country before that. Also participating in the discussion, Rose reminisced about the times she won RRI’s Bintang Radio competition between 1958 and 1966. “[Then president] Sukarno was very interested in RRI, so he invited the winners and crews to a reception in Bogor Palace. He invited all the ministries as well,” said Rose. According to Rose’s autobiography, Kisah Mawar Pandanwangi (The story of Rose Pandanwangi), she was asked to perform Kisah Mawar di Malam Hari (The story of Rose at night) in front of the first Indonesian president. “Did you hear that? That’s [what I call] singing,” Sukarno praised the performance after Rose finished her song. Sukarno’s support for seriosa could be one of the reasons the genre gained popularity back then. However, as the regime changed, Faizah said that people could not merely depend on the government. “Individuals must come and step forward,” Faizah told The Jakarta Post on the sidelines of the event, adding that she expected the tribute to gather people and raise awareness of the genre. More performances followed after the second discussion. Musician Ananda Sukarlan appeared on stage alongside classical singer Nikodemus Lukas to recite four poems by celebrated poet Sapardi Djoko Damono, namely “Terbaring” (Lying Down), “Ketika Kau Entah Di Mana” (When You’re Somewhere), “Di Kebun Binatang” (At The Zoo) and “Dalam Sakit” (In Pain). The composer also shared the stage with Sapardi to read one of S. Sudjojono’s poems, “Mijn Brui den Mijn Koningin” (My Bride and Queen), which was taken from the artist’s My Queen painting. Nikodemus later recited the same poem as well. However the most anticipated moment was when Rose took the stage and performed the national song, “Indonesia Pusaka” (Heritage Indonesia), accompanied by Ananda on piano. Despite her age, Rose’s voice was very clear, powerful and moving. 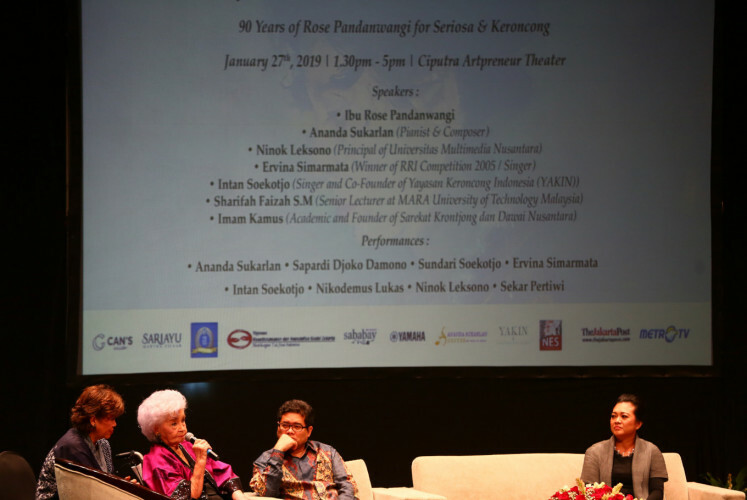 The Story of Mawar: Rose Pandanwangi’s 90 years of Seriosa and Keroncong is part of a series of events held by the S. Sudjojono Center (SSC), an organization initiated by the artist’s family and fans that aims to preserve Indonesian art. The first event of the series, Hey Djon, was held in December 2018 and featured a combination of poetry reading, musical performance and video mapping. Maya Sudjojono, the organization’s director and one of the couple’s daughters, said that her mother was very touched by the event.